Couple of years ago I decided to fill my free time by organizing my awful looking backyard into a beautiful garden. The activity I thought to be a couple of months project became a much longer learning experience. During that time a learned a lot about different type of plants, fertilizers, watering techniques, soil types, compost and many other things that the vast topic of plant cultivation and organization has. But today I am not going to talk about these things. Today I am focusing on weather, technology, and data. This is a short comparison table and overview of all the devices listed in this article. It is for folks that have a general idea of the features they are looking for. For more detailed overview please scroll bellow this table. The effect of the weather on your garden. The thing I lacked most during the years was the awareness of unexpected weather conditions and the effect they have on my precious plants. I was unaware of difference between fast temperature drop and slow temperature drops, and how they affect my plants survival. Another important factor was the soil temperature and how it may be the best indicator on when to plant certain types of vegetables, and when no to. I was dumbfounded when I found that I can track my micro climate patterns to forecast my local conditions. What do I mean by weather patterns? With device like the garden weather station and their software you can track local atmospheric conditions, and how do they unfold in time. Then you compare current and past periods and by thus you become conscious about upcoming weather. But the benefit I like the most is that everything is super localized – all the data comes from your backyard and not some (distant) weather forecast report on your local TV station. Currently I am quite happier with my new setup, and now I am quite informed about the weather my garden is exposed to. Data gathering, alarm setting, and learning about weather are useful skills to any gardener’s arsenal. Leaf wetness sensor – detects the amount of liquid moisture on the surface of the pants. Useful for preventing plant diseases. This is automatic weather station that wirelessly transmits all the data from the unit outside to inside console or computer. WS1001 comes with very competitive feature – a separate indoor sensor unit that you can use inside your greenhouse. I was very surprised that none of the other competitors offer such option. 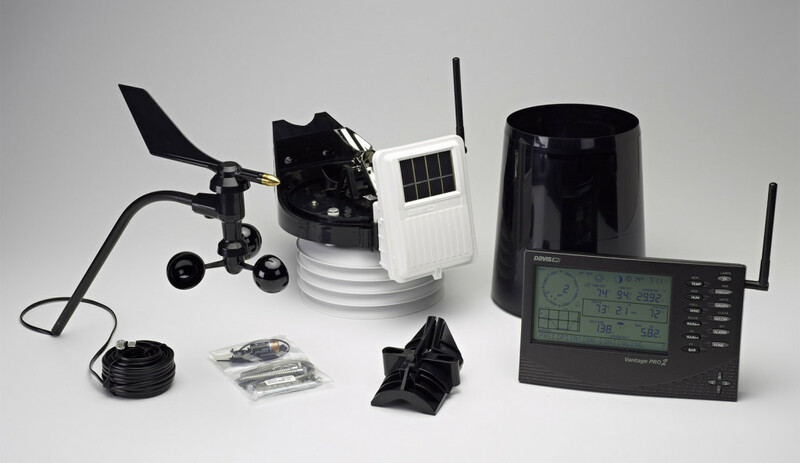 The outdoor unit includes all the necessary weather sensors like anemometer (wind), rain gauge, thermometer, and barometer. It comes with 3 rechargeable alkaline batteries, installed and well shielded inside compartment at the bottom of the device. The indoor unit gives all the data you will need to stay informed on the conditions in your garden. The upper left corner contains a chart, controllable by you, that displays things like temperature, humidity, and barometer info with appropriate time frame. Below the table is the solar radiation reading, barometer section, and rainfall data. The wind readings are in the upper right corner with, direction, current wind speed, wind chill, and wind gusts variables. The temperature and humidity info is in the lower right section of the indoor unit, with indoor and outdoor readings for both of them. The indoor unit has lots of features which I am not going to list in detailes, but be sure to check the alarm section and historical data. If you want to publish your data on the cloud this station has all the needed features. You have two settings manage these options – Wi-Fi scan and the Weather served. With the Wi-Fi option the device will scan all the networks that are within the are of operation, and once you choose the network it will let you enter user name and password for the connection. This feature is super convenient and very easy to set up. As for the weather server set up it was as simple as selecting Weather Underground option, entering station ID, and populating the password field for your WU account. After this operation all the data is instantly pushed to WU database for storing and visualization. The software makes quick live updates that are very cool to see in action. If you want to download your logs the console has SD card slot for easy access. 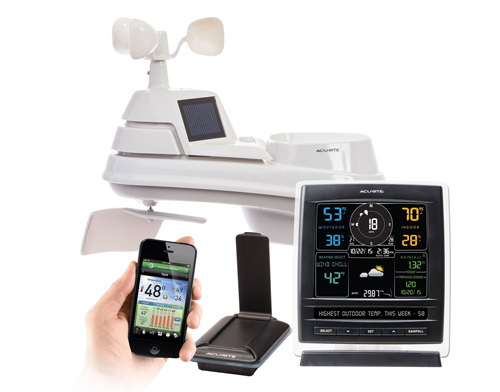 Overall this is a very good weather monitoring device, with two very good features – additional indoor sensor and console that uploads that weather data straight to the web. 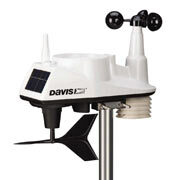 Vantage Vue is one of the top products of the Davis Instruments weather station line. 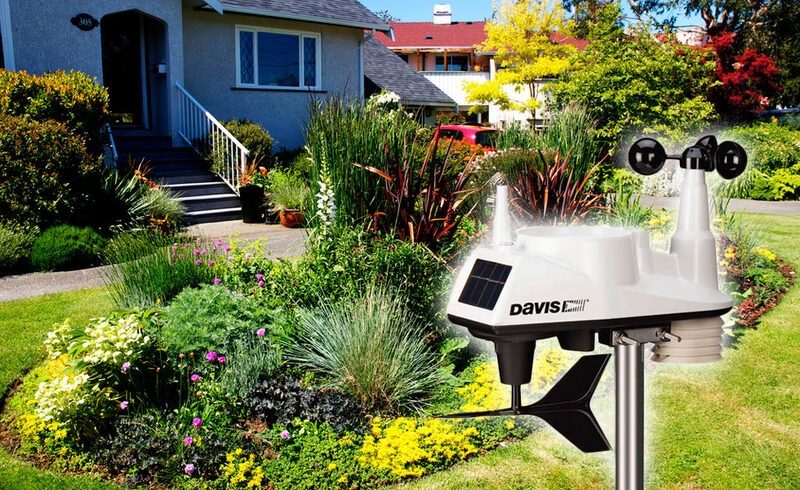 It combines the reliability, accuracy, and durability of all Davice’s devices, but on very affordable price, with installation and configuration that are easier than ever. 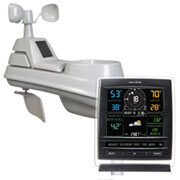 Similar to all the stations in the class the Vantage Vue consists of two components: the indoor sensor unit (ISS) and the console to receiving the weather information. The sensor unit collects meteorological data such as ambient temperature, the quantity and intensity of rainfall, wind speed and direction, and transmits them by Wi-Fi to the console. Vantage Vue has a good, readable screen (7.6 cm. X 8.5 cm. ), and the keyboard panel equipped with back-light. Vantage Vue also works with WeatherLink software, allowing the users to transfer weather data to a PC or weather website for in-depth analysis and graphical presentation. 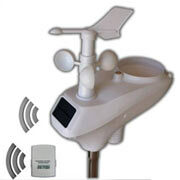 WeatherLinkIP software can create for each individual weather station a website that will be published on www.weatherlink.com website. Updating of data every 2.5 seconds. Rain gauge (rain bucket accuracy rainfall in increments of 0.01″(0.2 mm). The anemometer (wind speed records from 2 miles per hour (3 km / h) up to 150 miles per hour (241 km / h). This is s superb tools for measuring and collecting weather data, with great value for the money. You cant make a mistake with this one. The only con is the lack of soil meter integration. But this one you can always buy separately. This station is the link between the professional and the home consumer segment. Currently this is the best device on the market that has all the sensors, and in the same time comes at reasonable price. It is perfect for weather enthusiast, gardeners, and all types of buffs and geeks. The outdoor sensor unit looks much more differently than the other stations in this class. It has the appearance of a professional weather device and not the standard home weather tracking tool. Vantage Pro 2 is well equipped with calibrated and accurate array of sensors, ready to report data. It connects to the inside console via Wi-Fi, so need to worry for cables blocking your house. Vantage Pro 2 is currently the only station that has the option the interface itself with soil sensor. That will give you the ability to measure soil moisture and temperature. This option is perfect for people wanting to have the full picture inside their garden. The indoor console is a compact with easy to see digital display with multitude of functions you’ll find useful when monitoring your garden’s micro climate. Connection with your Weaterhlink software or Weather Underground is a breeze. Then your current and historical weather data is universally available. If your desire is to have best gadget in the segment, with all the sensors, this is a must have instrument. 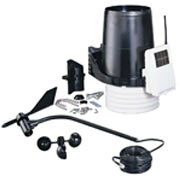 Very well build with superb accuracy with the best rain gauge. Of course all the benefits this station has come at a certain price. 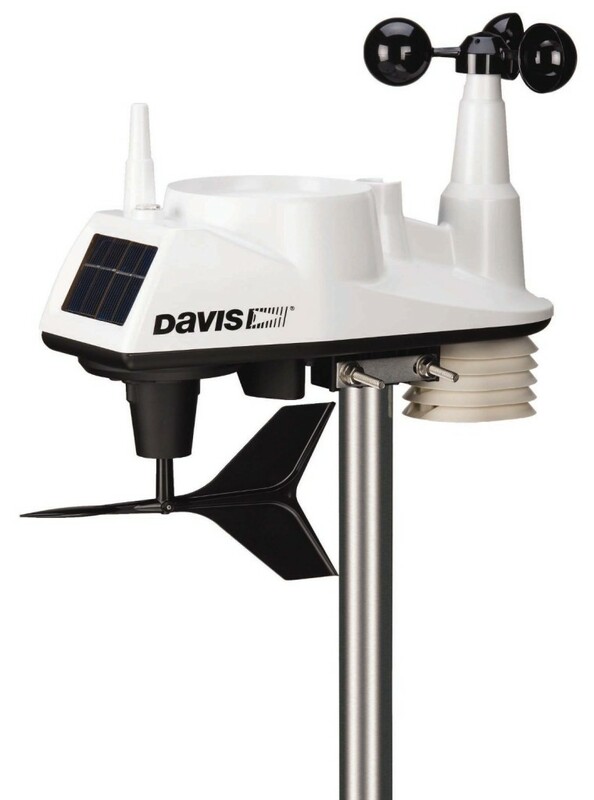 Vantage Pro 2 is the most expensive weather station in our list, but not as expensive as some of the professional instruments on the market. WeatherLink interface for your PC or Mac. UV sensor for measuring solar radiation. Electric heater for melting snow on the rain gauge. Gathering of meteorological data and producing weather forecasts. Displays current date and time. Indication of moon phase, sunrise / sunset. Measuring the temperature of the air inside and outside. Measuring the relative humidity of the air inside and outside. Measurement of the wind speed and direction. Graphical display for displaying meteorological data. Minimum and maximum recorded values. Audible alarm when thresholds are reached. Ability to view weather data in different locations. The collection, analysis and graphical display of information from a personal computer. Computer interface with a memory capacity of 2560 records of meteorological parameters with date and time. 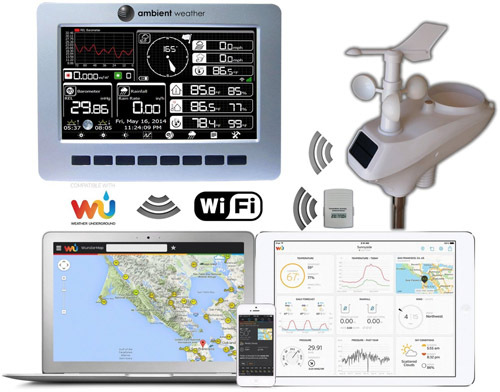 You are looking at easy to install 5-in-1 weather station, which also includes user-friendly internet bridge device to upload your data on the cloud. Similar to all other devices in our list, 0105RM has the entire set of necessary sensors to monitor your garden’s climate – this includes temperature, humidity, rain, wind speed, and wind direction. The pack includes the AcuRite Bridge that can report and upload your data over the Internet, were you can remotely monitor all your environmental data. The bridge removes the necessity of computer system for uninterrupted data logging. The AcuLink software is very customizable. It has the useful ability to set automated email, and text alert notifications. All that is available when the weather conditions are changed or some customized preset is reached. This included in the package add-on, makes the connection with Weather Underground or publishing data on the web a very easy task. All the recorded weather variables are accessible from virtually anywhere via the AcuLink app – available for smartphone, tablet, and computer. You can track daily, monthly, and yearly trends form user friendly graphs and charts – on AcuRite’s website or your home computer. A digital color display, lists all the necessary sensor data, with the addition of – 24 hours weather forecast, heat index, and dew point. AcuRite 01058RM is good reliable station with all the necessary sensors. I think the biggest plus that comes with this package is superb price and the AcuLink Bridge, that removes the need of computer for data logging and transfer. Definitely worth buying or at least and that’s what that I did.